Rebecca Woo has been interested in Hawaiian music for about 11 years. Her mother was not Hawaiian but was born in Hāna, and also lived in Honolulu, where she met Rebecca’s father during WW2. 11 years ago, Rebecca saw an article about the ukulele scene in the Bay Area and decided to become a part of it. In the first player group that she joined, the group’s leader had grown up in Honolulu, so the group’s songbook contained lots of Hawaiian and hapa haole songs. Rebecca was taken by the poetry of the lyrics and the beauty of the music itself. In late 2015 and early 2016, Rebecca completed a four-course online ʻŌlelo Hawaiʻi (Hawaiian language) series offered by the Kamehameha School’s Distance Learning program; studying the language has enhanced Rebecca’s understanding and appreciation of the music that she loves. Also in May 2016, Rebecca started playing kīkā kila (steel guitar) which is one of the mainstays of Hawaiian music. 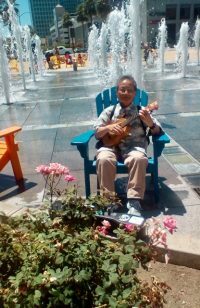 She attends kanikapila on a regular basis and performs with Nā Hoaloha, the ʻukulele program of the Japanese Cultural and Community Center of Northern California (JCCCNC) and occasionally at other gigs.